MudmotorTalk.com - View topic - Weed cutter? Just got a new 40 hp FPR motor. The thing is a beast but is there a weed cutter that anyone would recommend. My buddy has one that is like a blade that cuts weeds wrapping around shaft. He doesn’t remember where he got it.Any recommendations? Preston used to make them but he no longer does. Can't get them anymore. prodrive makes and sells one. call and ask. I run one like it on my 40pd. it works. !!! When they start that?? I'm calling Travis today. 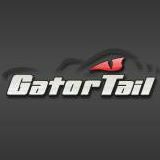 Don’t need one on a gatortail the lower unit is designed right!